The rain in Spain, kept falling on the plain. Madrid on a Sunday was cold, wet and overcast. I joined the locals for a Sunday promenade, with everyone in their Sunday best. The locals say Madrid has nine months of winter and three months of hell! I had arrived early in the morning after spending the night on Swiss Air with a well-dressed man who was horrified to be sharing the exit seat with me. He only spoke French, but I discovered he was fluent in English. He was into ‘manspreading’, and hogged the armrest. Customs in Zurich, Switzerland were surly and put on plastic gloves to pat me down, which did make me a little nervous, and reprimanded me for having my small bottle of makeup in my purse. I thought I might have to sit up straight eating muesli as a punishment. As we left Zurich we flew over delightful Hansel and Gretel houses, through the clouds where there were majestic snow-covered mountains as far as the eye could see. The Hotel Praga in Madrid, Spain — chosen by Cosmos Tours — was way out of the city centre. Armed with my limited Spanish, I caught the metro and the bus to get to Plaza Mayor, a major public space in the heart of Madrid. I got lost, and got found! Then headed to the Museo del Romanticismo, which closed after 15 minutes of my arrival. Most of the museums are closed on Mondays as well. Probably not worth the effort. 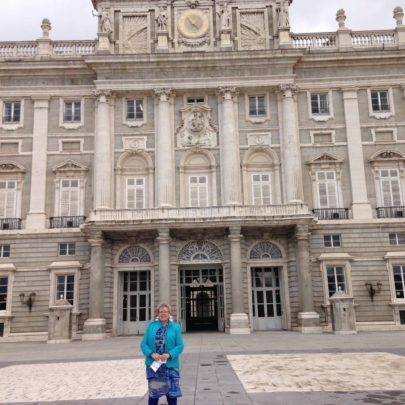 The Royal Palace was open on Monday and it was quite spectacular, except for the other tourists! Some of who also forgot to pack their manners. Our tour leader was a young hipster called Hor-hey… Jorge. He obviously had been warned about me, as I had a little whine to Cosmos before I left, regarding a seat to myself on the bus and a quiet room. As I’d paid the single supplement, which was almost double what everyone else paid, I wanted these two things. The Cosmos coordinator gave me flowers and called before I left to ensure all was well, and Jorge always had my room key first, initially to work out who I was and to ensure I had a quiet room. The hotel I’d stayed at in Lisbon was invaded at 11:30pm by 180 school children, all screaming and rampaging on my floor. They were treated to a vision of me in my nightie, yelling at them to keep quiet. Jorge had to find me another room in this fully booked hotel… but I got one! 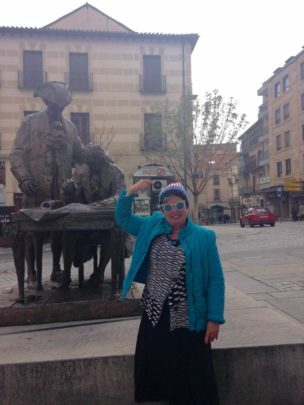 We travelled through Spain up into the mountain towns of Avila and Salamanca, which were extremely cold and wet. Salamanca is a huge university town. Both of these medieval towns were important for defence, as were the Portuguese towns on the other side. The area is festooned with large round boulders. The towns were a harsh sombre ochre, with extensive castles and cathedrals. Crossing the border, the countryside became gentler, with lush green fields, blossom trees, olive and cork, and a surprising amount of imported eucalyptus. Our first stop was Coimbra, Portugal an important university town, where the students celebrate the end of the academic year with the ‘Queima das Fitas’ (‘Burning of the Ribbons’). Organised by the students’ union of the Coibra university, this festival lasts eight days — one day for each of the faculties. 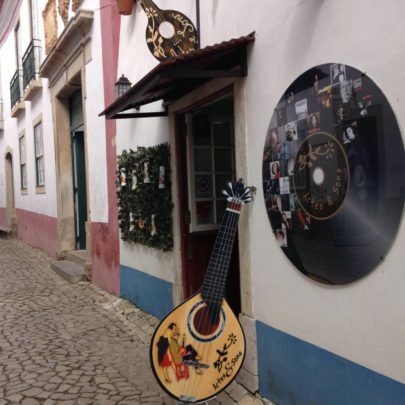 An hour away at Obidos is an amazingly beautiful medieval village. On the day we arrived, it was totally engulfed by tourist buses swarming through by the hour, sampling the ginga (cherry liqueur) in chocolate cups. It tasted a bit like cough medicine! Thankfully, I returned to Obidos on another trip, and feel it is most enjoyable at night after the tourist buses have departed. 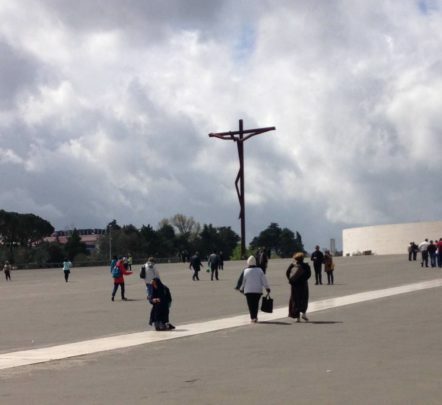 Our last stop was Fátima, which I had no desire to go to, but found to be quite interesting. It is home to one of the most important shrines for Roman Catholics, dedicated to the Virgin Mary, and something like 8 million pilgrims travel there each year. Even our hipster guide was genuflecting before the altar. There were huge amounts of pilgrims, some of whom had walked from their homes (all over the country) and the walked on their knees to the shrine. Personally, I thought the orthopedic surgeons of Fátima were making a fortune. When we arrived a full-on procession was happening with a cast of thousands, flowers and holy relics and religious music blasting out. It was an interesting spectacle, and even as a non-believer, I could feel the huge amount of emotion emanating from the place. Have you travelled through Spain and Portugal? Is it on your travel bucket list? Keen to share your thoughts with other 60-pluses? You can sign up as a contributor and submit your stories to Travel at 60. While you’re at it, why not join the Starts at 60 Bloggers Club on Facebook here to talk to other writers in the Starts at 60 community and learn more about how to write for Travel at 60. Community blogs published on the website go into the draw for some great weekly prizes.